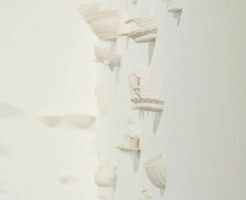 Heirloom was a site-specific installation made up of more than 2000 cast porcelain objects collected from local sources; each object communicated its own personal narrative in relation to the history of domestic life in Swansea, where the Mission Gallery is situated. 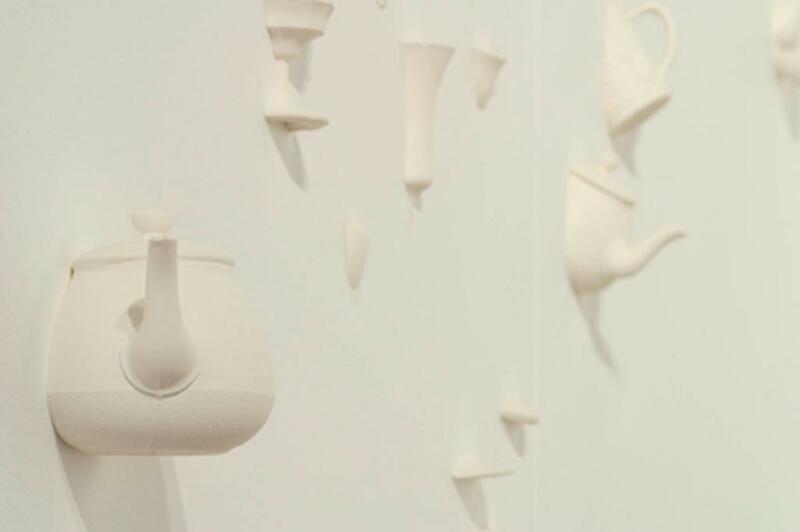 These once dynamic objects were effectively transformed into a pale porcelain tableau that surrounded the walls of the gallery space; the objects were reduced to mere echoes and traces. As all the objects related in some way to the local history, their collective narrative was more relevant to visitors to the gallery space. 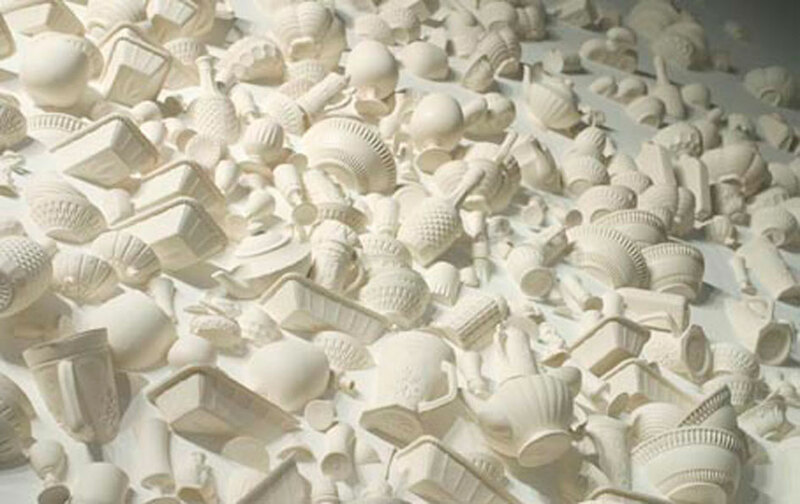 Heirloom was a site-specific installation made up of more than 2000 pieces of cast porcelain objects; each of these objects related to the local history of domestic life in Swansea, where the Mission Gallery is situated. All the objects were collected from local sources, making the final narratives more relevant to visitors to the exhibition space. The exhibition exposed languages that challenged the space and the sensitive use of material that gave voice to the inherent narratives. 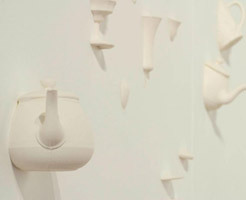 The work comprised a porcelain body that related to the tradition of porcelain used in ornamentation in the home. 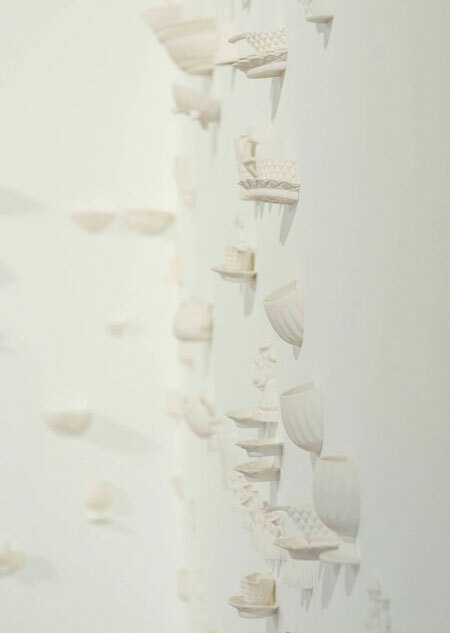 The once highly-coloured and chaotic objects were transformed into a wash of pale porcelain in the gallery space; the objects became instead ghost like memories and whispers. The aim of this work was to respond directly to the exhibition space, to represent a local narrative that would be visually apparent. This was made possible through a continual process of feedback from the public in the development stages. 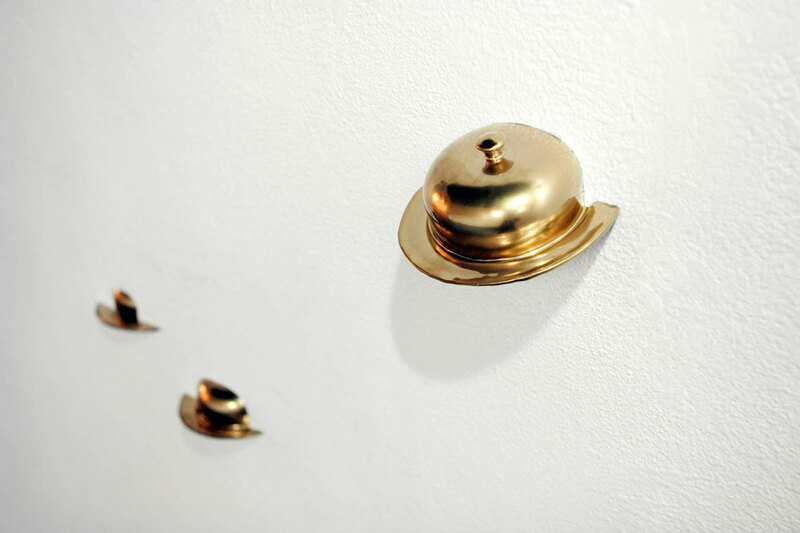 While her work is suggestive and has undoubted meaning, the viewer is entitled to feel that in the appearance of Clare Twomey’s work there is something missing. 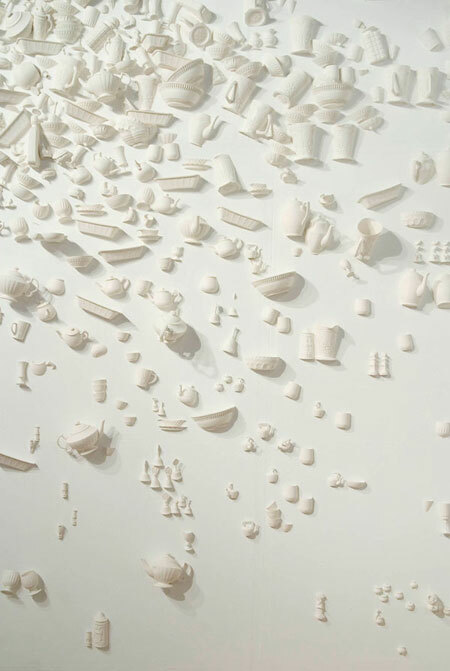 As a leading member of that group of artists who graduated in the mid 90’s and are now establishing themselves, she shares the inheritance of a kind of art in which there is so often something missing. It is as if, in both painting and sculpture, the figure has fled – that the assertion of the body, or of the landscape, or of the artistic subject itself – that this shareable figure has escaped these artists and left them now to their own devices. 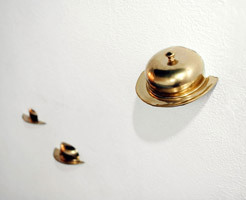 This transfer of authority and power away from the aesthetic object and towards something increasingly purged does have meaning, and I believe that when an artist of Twomey’s sensitivity finds herself offering such low-key and depleted things as other people’s butter-dishes or another era’s horseshoes, then we are dealing with a current artistic temper of almost excruciating honesty and reserve. 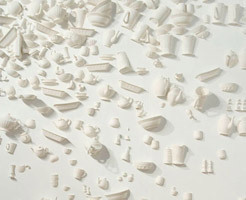 In contrast to the sculptural showing-off that comes from placing the artist’s offering upon a plinth, with Twomey it is laid upon the ground – to be broken underfoot, or embedded in liquefaction, or alternatively suspended weightlessly from above; what is more, the objects so treated are shy of asserting their significance: it is not the artist who has made them, nor is it that the artist has even chosen them. 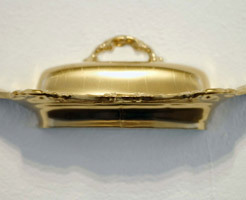 The butter-dishes and the knick-knacks, the horseshoes and the forks – these are simply things that offered themselves at the various locales she has worked, whether at the car-boot sales of South Wales (the Mission Chapel) or within the grounds of a property in Gateshead (Gibside). And the residual poetry of these lost and lonely pieces of domestic history, even that is expunged. Not the real thing now, bartered for or unearthed, but its ghost-white simulacra, cast mechanically – a poor cousin of the real thing, de-coloured, and in a final twist in the story of its abjection, sunk… into the wall or into a puddle of earth at our feet. 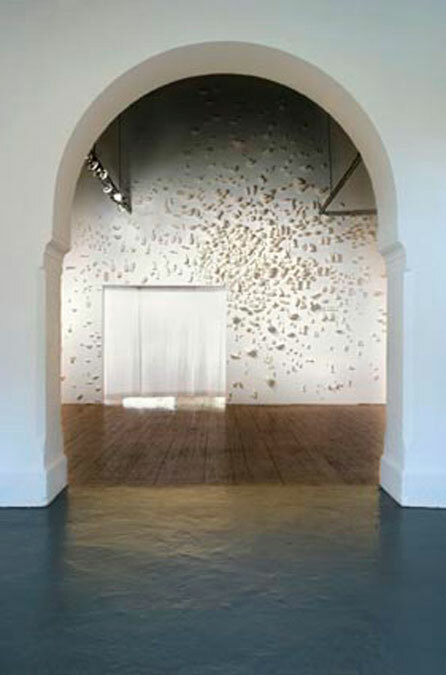 Historical places of the sort that Twomey works with have their own particular moods, and her installations search out and evoke that mood. 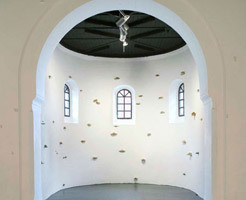 It is this that makes her work contemporary – an elegiac sensitivity to the fading spirit of places. At Gibside, where the mood of stately-home bustle is lost yet somehow lingers; in Conscience/Consciousness, where the altogether different mood of an art gallery is emptied by her of all pretension and given back as a place filled instead only with tension; and at the Mission, where the sacramental space of priest and congregation is returned to the art-goer as a space bleached of meaning, where the objects of that last refuge – home – withdraw into the walls under some mysterious centrifugal pressure. 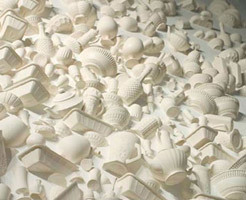 Art, in the hands of an artist such as Twomey, is not an activity aimed at consoling. The rich or reverent spirit of her sites has gone, along with the social beliefs that enabled such a spirit. Her job is not to erect new beliefs (like those beliefs that once created beauty, at a price); her job – perhaps one could even call it her vocation, and the vocation of those of her generation – is to slow us down – to de-clutter our response to old places and thus to let us just be there, in a curious simultaneity of regret and relief. 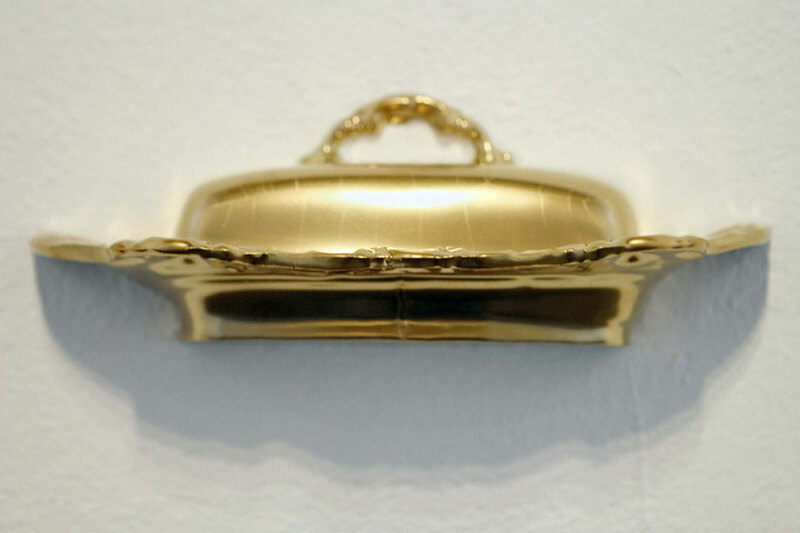 What is missing, then, are the trappings of art, but not its purpose. In re-attuning our response to various places she is acting rather like those architects of the Low Church who hoped to engender contact with something metaphysical by the emptying of space rather than its decking-out. Her language is not that of the whitewashed column or the plain altar but is a parallel one, a language of those other simplified things we now cling to, which just because they are domestic is not necessarily to say that they are devoid of all sacramental significance. We cannot ask artists to invent the reasons why we should be positive. If the busy pageantry of Gibside has gone, or if the reverent celebration of the Eucharist has left the Mission, those are the facts. 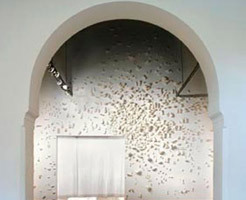 It is a fact too that galleries and museums, so often called the cathedrals of our day, are the stages for types of experience that are altogether less shared and demonstrative than those of cathedrals. There are no visual rituals attached to the viewing of art or of most types of contemporary spectacle, and the absence of celebration in contemporary art reflects this. 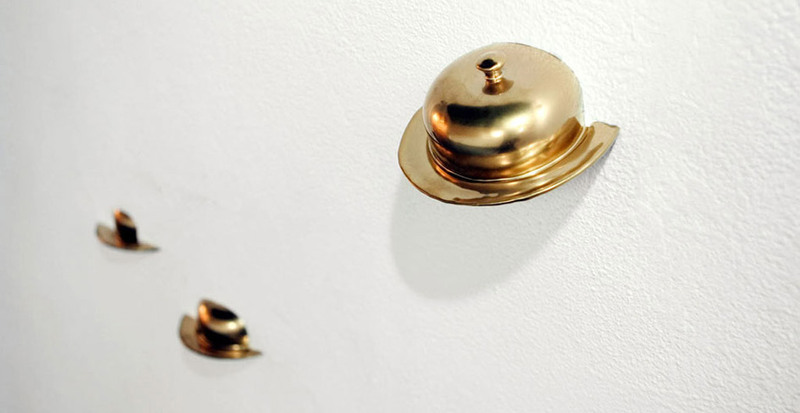 The apparent passivity of present art is – to rephrase – a reflection of a certain cultural passivity. Twomey, I think, understands this. When I asked her where she thought colour in art had gone, or glory for that matter, she replied that these were perhaps ‘no longer necessary’. Her reaction is at one with present culture. Places such as Gibside or the Mission may have a future that is entirely more celebratory than at present. If, at our particular cultural moment, Twomey creates a mood that is by contrast reserved and wistful, then she is being accurate and honest about the current status of place. Action, the figure, ritual and even glory may return to our public places, but only when, as a culture, we actually feel such things to be necessary, to be actually demanded. 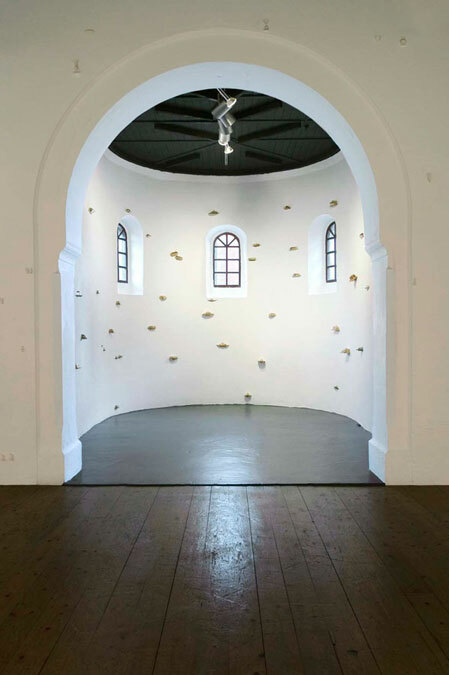 In the meantime, there is a sense in which the apt artistic occupation of historic places will appear like an interim activity – contemplative and at the same time poetically tense with anticipation.